Jody Kae Miller of Bowling Green, passed away Saturday, November 10th, under the care of Bridge Hospice at Woodhaven Care Center, BG. Jody was born in Findlay, OH, October 31, 1956 to James(Jim) and Joan (Dill) West. Jody was a graduate of Bowling Green HS and BGSU. She spent several years in Colorado Springs working with the Navigators, a Christian outreach organization. 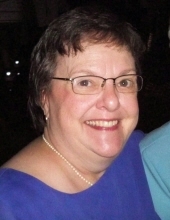 Jody's interests included gardening, canning, baking and cooking. She enjoyed sharing her homemade creations with friends and family. Jody married James Miller, March 30, 1996 in BG. He preceded her in death, December 17, 2016. She is survived by her mother, Joan(Milton) Boxley of Rudolph, brother Mark (Gloria) West of Rudolph. Stepchildren, James(Jennifer) Miller, Lincoln Park, MI, Amanda(Jesh) St. John, Curtice, 5 step grandchildren, 2 Nieces, a nephew and great nephew. She was preceded in death by her father, Jim, and brother Matt. Jody was a member of the BGSU Alumni Association and South Liberty U.M. Church. A memorial service will be held Sunday, November 18th, at 2 pm at South Liberty U.M. Church at the corner of Bays & Potter Roads, Rudolph. Internment will be private. Final arrangements were entrusted to Peinert-Dunn Funeral Home in Tontogany, Ohio. To send flowers or a remembrance gift to the family of Jody Kae Miller, please visit our Tribute Store. "Email Address" would like to share the life celebration of Jody Kae Miller. Click on the "link" to go to share a favorite memory or leave a condolence message for the family.